I want to start off by saying, all babies are different so my suggestions may not work as easily for your baby than another baby. My baby is now 1 month old and he is not sleeping more than 2 hours at a time at night. In the beginning I was blaming it on the fact that he just had his nights and days mixed up, but now I am beginning to wonder. 🙂 He is quite collicky and doing a lot of spitting up. My first child had acid reflux as a baby (it was horrible) and I am praying that this is not the case now. But as your baby gets older and they get on a better sleeping and eating schedule, there are some things might help them become better sleepers. With my first 2, they were sleeping through the night by 5 months old. All of my friends were amazed because they had little ones still getting up at night at 2 years old. I have to say that a baby should most definitely be sleeping through the night by 9 months to a year old. And if they aren’t then you might just be giving in to them too easily. Well, let me go into my list of things you can do to get your baby to sleep through the night and I will go into more detail about everything. 1. Be Consistent – It is very important to introduce consistency early on. Getting baby on a schedule is great. You can even do this when you baby is a newborn. One thing that I try to do is go to bed at the same time every night. I try to keep track of the feeding times. You will see that they will wind up getting up at the same time each night to be fed. Both babies and children need consistency in their lives. They will be much more well rounded as they grow up. I have always had my children on a schedule and now with my 2 older ones (4 & 5 yrs old) they know what to do no matter what time of day. In the morning, they know that they eat breakfast at 7:30am after I have fed the baby. They know that after breakfast they have to wash their hands, get dressed, and brush their teeth. I make sure we do the same thing in the same order because then they pick it up much easier. Even my 1 yr old knows his naptime and right when he wakes up from his nap, he runs to the kitchen because he knows that it is then lunch time. Keep Bedroom Dark – This is a great tip if your baby is having a hard time getting adjusted to night and day. Even if they are in the bedroom with you, you can still create an atmosphere of calm. And when you get up for all those late night feedings, don’t turn the TV on. Bedtime Bath – Giving your baby a bath right before bed is a great way to calm them as well as get their energy out. You will see that they actually sleep longer once you put them to bed after a bath. Add Cereal to Nightime Bottle – You can do this once your baby hits the 3 month mark. The cereal helps their belly to be full for longer so they sleep longer. 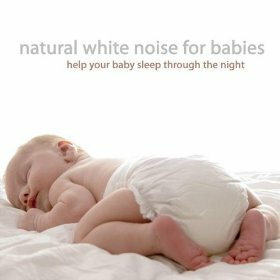 White Noise – I have a Sleepmate in our bedroom running at night. It is a small machine that creates white noise (a fan type sound). I turn it on right before bed. They say that this can help your baby sleep better. Keep Bedroom Cool – When a room is hot, it is much harder for a baby to be comfortable. When it is cool they can get warm & comfy being swaddled or under their blanket. Use a Humidifier – This is especially important during the cold months when you use the heat. Dry air is not good for a baby to breath while they are sleeping. They need moisture and a humidifer helps to put the moisture back in the air that the heat takes out. 2. Put Your Foot Down – A lot of new moms have a hard time not giving in to their baby, especially when they cry. Once you know that your baby has been fed enough and they are still getting up to be fed, you really have to work at breaking their habit. Getting up at night to eat becomes a habit because they are doing it for so long. Once they pass 6 months and are eating solid foods, then you know that they can probably survive without eating every few hours like they did when they were small babies. But, be warned, they will cry and if they are older, they will throw a tantrum. It can be heart wrenching to listen to them cry that first night that you deny them their feeding. It usually take about a week and they will finally be broken of that habit. Many moms don’t follow through and then they complain that their baby doesn’t sleep good at 1 or 2 years old. But it is their own fault for giving in and not breaking the habit. You can start the process by giving them water at one of the feedings instead of their milk. That was something I did as well. 3. Get the Baby out of Your Bed – I have to be honest with you, I was always against keeping a baby in your bed especially if you share it with a spouse. I never had my first 2 in my bed, but once baby #3 came along, I wound up kicking my husband out and keeping the baby with me in bed. It was just so much easier for me to feed the baby and do what I needed to do. I was plain exhausted, so I did what worked for me at the time. And even now with baby #4, he is also in bed with me and my husband has been sleeping in another room. So, I am all for making things as easy as possible so that you get more sleep in the long run. But long term, having a baby in your bed can actually cause them to get up more and breaking that habit will be harder as they get older. 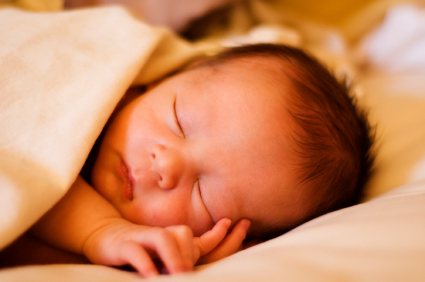 Even having the baby in a bassinet will be better because they will sleep more soundly. These are just a few things that I have done as a mom that have helped my children become great sleepers as early as 5 months old. Again, every baby is different. You will have to do what is best for you and your baby, but just know that you do have the power to help them break the habit of getting up at night. And if you are like me, and have a newborn baby – then we are in it for the long haul. 🙂 You cannot NOT feed a small baby, especially if they are eating only milk. very informative post…thanks for sharing! .-= Teresha@ Marlie and Me´s last blog ..Wordless Wednesday: Daddy’s Shoulders =-. .-= Stefanie´s last blog ..Toys For Children With Special Needs =-. Great tips! We just got lucky with my oldest – she was a great sleeper even though she was colicky most of the afternoon and evening. We weren’t so lucky with my second daughter. We did swaddle her for awhile and that seemed to help. I hope your little guys starts sleeping longer for you soon! .-= Laura´s last blog ..Saturday Chuckle =-. Thanks for the post however I would like to say that I don’t agree with putting cereal in the baby milk. That is really bad for the babies and I have had a baby who died because the parents tried to force her nor to eat at night and she got dehydrated. You can’t force these things and cereal is tough on their tummies and can cause tummy cramps. Babies should be on milk ideally till 6 months and weaned at min 4 months because their kidneys and livers cant cope yet with solid foods. Adding cereal that early on can also cause an increase is cot death. I have spoken to many paediatricians and sleep specialists and it is absolutely normal for a baby if a baby doesn’t sleep through the night until they are 1. We are parents, we chose to be parents. It isn’t easy or convenient to be parents and cutting dangerous corners is not always a good idea.